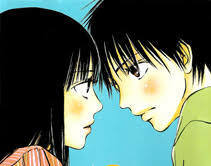 3×3 Eyes | Manga Reviews ~ Ramblings of A Fob. I find it appealing if a series is dated. So I was very much excited to read 3×3 Eyes. It’s a fantasy adventure series from the late 80’s about a maiden girl whose a “Triclops”. Pai is from a Tibetan tribe, she’s the sole survivor of a mystic clan that possess the power of eternal life. She wants to become human but the reason behind this is unknown since she said she have forgotten about it. In order for her to become human she has to get help from an unlikely human named, Yakumo Fujii. Yakumo doesn’t believe in supernatural phenomenon, so he is hesistant to help Pai at first. When he learned about the letter of his deceased father and got caught in the amidst of raging beast of legend, he suddenly became an immortal being. Pai transformed Yakumo into Wu, she had merged her to his soul. So as long as Pai is alive Yakumo is immortal. Yakumo decided to help Pai become human in order for him to return to normal. Thus begun their journey, first they must find Mr. Aguri who might have the key on how to turn Pai into human. Mr. Aguri runs a magazine company that publishes articles about supernatural phenomenon, myths and other occult related stuffs. Pai and Yakumo met Mr. Aguri’s assistant, Ling Ling. They’ve learned that Mr. Aguri is taking care of some business. Unknowingly to them that Mr. Aguri is killed by a seemingly immortal being just like Yakumo. This first volume of 3×3 has all the common elements of a good fantasy adventure series. We’ve got an interesting Tibetan/Hindu myths. The art is dated but still awesome. If you’re familiar with Rumiko Takashi’s series like Inuyasha you’ll find this series appealing. I am looking forward into reading Yakumo and Pai’s adventure. Twas a good start.